Online Casinos are truly a great way to gamble without having to leave the house. However, there are some that take advantage of Australian players in many different ways. That is why we at Pokies.com have decided to put together a guide to inform players of blacklisted casinos and how to identify them. In this way, gamblers can avoid these casinos and make informed decisions when deciding on their gambling destination. Read on to find out all there is to know about blacklisted casinos online. 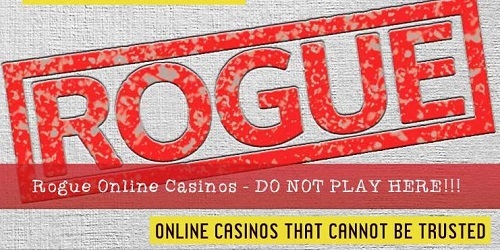 How Do Online Casinos Get Blacklisted? So, a casino will become blacklisted if they behave in a manner whereby its acts are always contradictory to the best interests of its players. Please take note however, that these are not casinos that we have a problem with. Many online casinos do not offer the best service, yet this doesn’t mean that their practices are unfair or worthy of being blacklisted. This guide is going to look purely at internet gambling sites that have or are busy committing serious offences and should be avoided by Australian gamblers at all costs. Below is a list of offences that will ensure that an internet gambling site will become blacklisted. Below we will explain the aforementioned list in more detail. Everyone joins a real money online casino with the hopes of winning some cold hard Australian Dollars. So, could you imagine hitting a jackpot with a mind-boggling cash prize, and the casino never pays you out? At this stage you are probably wondering what is going on, because there were no issues when it came to the casino accepting your money, but now that it comes to the payout you are all of a sudden left in the dark. That is why not paying winning players out is red alert number one that the casino needs to be blacklisted. If your casino is promising you the world when it comes to online casino bonuses, and they are not delivering then it is obvious that you have been deceived by a blacklisted casino. Often what happens is, like at most casinos online, players have certain wagering requirements that they need to meet before being able to cash out their bonuses. However, with a rogue casino, players will often be offered these luxurious bonuses, to which they have met all the requirements yet will get no payout. The act of lying to players like this will guarantee the internet gambling site, a spot on our blacklisted online casinos’ list. It’s all good and well for an online casino to inform its players on the new casino games and promotions that they have running. However, there is a fine line between informing and spam messaging players. It is often found that a rogue casino will bombard its players with spam promotional material. While the above aspects definitely ensure that a casino is blacklisted, here are a few other things to keep in mind when trying to identify a rogue casino. There is no legitimate licensing or regulation by any independent organisations. Blacklisted casinos clearly think of their own pocket first before the well being of their players. That is why to ensure the safety of your personal information as well as to get a fair and enjoyable gaming experience, it would be a good idea to use the information provided in this guide to steer clear of these casinos.